Utilizes GPS positioning to automatically detect the country the user is located in and connects directly with the local emergency services. Will be immediately notified the user has pushed the emergency button. A map and GPS location of the user will be sent to the three nominated contacts, who can commence to contact the user and ensure their safety and well being. 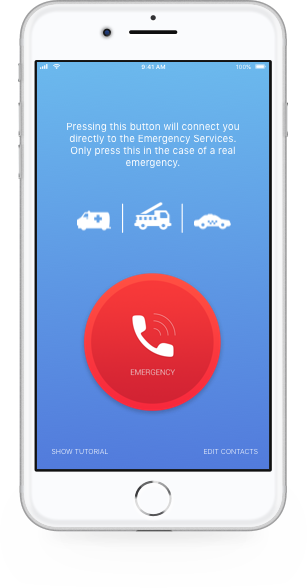 Will connect the user to local emergency services worldwide. App has a wide range of users including students international and local, travelers, elderly, parents, basically anyone. See the Safe Student app in action. Join thousands of happy users. My daughter is an under 18 international student under ISA guardian and welfare services’ care.she installed this app after she arrived in Mel. I feel it’s very useful for my daughter and parents. I will strongly recommend my friend to use this safe student app. Ying. A really simple solution that gives the user peace of mind everywhere in the world. Tested and it works! I travel a lot and this App gives my family piece of mind. For peace of mind knowing you will always be able to get emergency assistance when required.